Join the discussion on our forums! 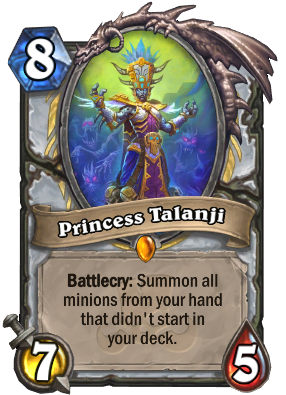 Come discuss Princess Talanji over in our dedicated Princess Talanji discussion topic. Got this in golden, should I dust it? I predict someday there will be an insane MEME combo with this card involving summoning a bunch of minions to OTK or something. Oh well. Until that day, this card seems painfully slow. Well, as a priest player in standart, I was dissapointed with the last couple sets of cards. But not really. I kinda see that you can shuffle SOME 1-cost minions and then cast Surrender to Madness or Keleseth to get the value. I think Surrender to Madness is designed to be played like Spirit of the Dead + Surrender to Madness + Bwonsamdi, the Dead + Princess Talanji or just cheap draw like Acolyte/PWS/Cleric, I will definitely try that in Spiteful, because I think developing early to mid game pressure plus late game buffed cards might work, but to call it meta defining is too much. In my opinion, cards that are gonna actually see play will be Mass Hysteria and Seance, and maybe Spirit of the Dead. Maybe Dragon Soul will return, getting giant taunts with Seance + Princess Talanji might be that support that this deck has needed since K&C. I have high hopes for this card as a Priest player, but do not recommend rushing it before, like, a month passes. For a control/midrange Priest to form I'd give a month to form. My prediction is that Priest decks will be mostly Dragon Package + Removal + Late game finisher like the combo I mentioned above. As for wild I would include this in a unique control Dragon priest, the package of spirit/loa/champion/mass removal with Seance, Kazakus and so on would make wild control priest even stronger, which I am happy about. Imagine you play Espionage Rogue and this card will be dropped by Blink Fox. Tried it, and yes she will! i'm surprised nobody has considered Elise, Trailblazer yet. She has been a staple for value in control priest builds. The problem with the un'goro pack was always that sometimes you just didn't have the time or mana to play all the mediocre minions you got . With this you can easily pop a pack and throw down Talanji. Not to mention, you can also Seance Talanji to play her again with more packs you got from Shadow Visions. Am i the only one who realysed that It's the second legendary priest card & it's not even the LOA? will priest have 3 legendary? didn't they say that all LOAs are beasts? I'm pretty sure this card could have some use with the new priest Loa Spirit of the Dead and the second Legendary Bwonsamdi, the Dead. Bwonsamdi draws all the 1 mana minions, then you play the Princess, and if you want extra fiesta, play a second Spirit of the Dead. Throw in a Surrender to Madness in the mix and you could have a great midrange deck. No one mentioned Stonehill Defender? Huge value for getting even one statue or lich king free. People have mentioned it. The problem is that you're probably going to pick a minion off Stonehill that fills in your curve way before turn 8. It's just not efficient to hold on to a bunch of resources to play them on turn 8 when you could do so earlier in the game. It's way too much to ask for. Also, as Priest, you're not likely to get the kind of taunt minion that you want compared to Warrior or Paladin either, and there's probably a better 3-mana card you could play as a consequence. To evaluate cards properly, you can't just look at the very small % idealistic case - but all of them. Like I said, we can't just look at the upside. There are more crappy taunt minions than good ones, and I think you'd be grabbing Saronite Chain Gang over pretty much any card if you don't have anything to do on turn 4. Let's face it, Priest turn 4 stinks other than Duskbreaker. There's also the times where we just don't have anything to play with her - we are forced to add a LOT of support we would not otherwise run to ensure we have something to play with a single copy of a legendary card you may not even draw that game. It's not really clear to me that these trade-offs are negligible compared to the turn 8 power turn she might provide. We have to figure out if the tempo play on turn 8 is better than having overall better cards in your deck, and historically, having better cards has been the answer most of the time. She's not Reno Jackson or Baku - that's the power level we need from the card in order to justify playing less powerful cards to support her, and I don't see it. I mean, Princess Talanji will probably only work with Seance consistently, or maybe Bwonsamdi, the Dead (!!!maybe!!!) I occasionaly include Curious Glimmerroot in my Spiteful priest/Wild control dragon Priest, cards like Entomb, Archbishop Benedictus might work as well. As for [cardCrystalline Oracle[/card] it's too inconsistent, Stonehill Defender is just not it for Priest in my opinion, as for turn 3-4 Omega Medic, Tar Creeper, Scaleworm, Twilight Drake, Trortollan Shellraiser with enough card draw/ dragon discover mechanics both old and new. I agree that it will have like 50% WR even, but as I already said the combi is to kill, shuffle 1- cost guys, buff them, draw them and then summon. Sounds too slow and finnicky? Yeah, cause it is not consistent to be constructed viable. I can imagine Tess Rogue drawing this wont upset them too much. Honestly, this card feels so dumb to me. It feels like its in the wrong class with this effect. I just dont feel this card being played. IDK I think my judgment may be clouded by my hate for the card. Expected something cooler or stronger. It just doesnt feel right with the current cards in priest. As for my hate for the card, I'll just let it out by saying: why does this even exist?